Air fresheners are a great way to add a fresh scent to your home or mask odors when you don’t have a chance to clean. But store-bought air freshers are often filled with chemicals and have a strange, perfumey smell. If you’re searching for a more natural way to freshen your home or just prefer to DIY your own scents, you’ve come the right place. 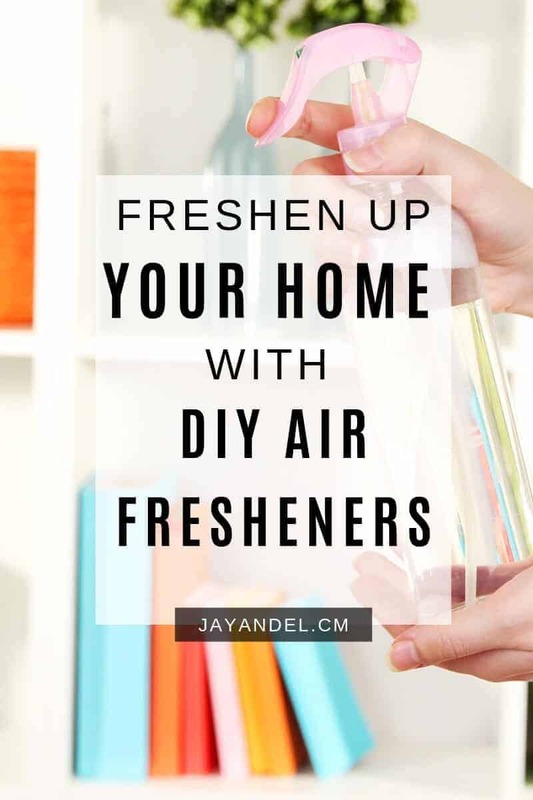 These DIY air fresheners will have your home smelling amazing without much effort. Essential oils are a great way to add new scents to your home in a more natural way. To create an essential oil air freshener, start by mixing ¾ cup water with two tablespoons of rubbing alcohol in an 8-ounce spray bottle. You can then customize the mixture with your own essential oil blends. For a relaxing scent, try adding 10 drops of lavender oil with five drops of chamomile essential oil. If you prefer a citrus scent, mix five drops each of orange, lemon, lime, and grapefruit essential oils. And for a fresh, floral scent drop in eight drops of lavender, five drops of geranium, and four drops of grapefruit oil. After you have added your essential oil mix to the water and alcohol, shake the bottle well and spray away. Baking soda is a wonderful natural air freshener. It instantly absorbs bad odors in the air, making your room smell fresh and clean. And while baking soda alone won’t add a fresh new scent to the air, combining it with your favorite essential oil will. To turn the common household deodorizer into an air freshener, combine one cup of baking soda with 30 to 40 drops of essential oil in a mason jar. Replace the lid and shake the jar to mix the ingredients together. Then, poke holes in the lid using a nail or other sharp object to allow the scent to come out of the jar and the odors in the air to be absorbed. Simmer pots are a great way to add a ton of fresh scent to your home while also making use of some of your food scraps. Citrus peels, like orange or lemon, and apple peels both make great additions to a simmer pot. To create your own simmer pot, combine peels with other scented ingredients, like cinnamon sticks and cloves, in a small pot. Add water to cover and bring to a simmer. As the mixture simmers, it will emit a wonderful aroma throughout your house. And the best part about this DIY air freshener is that it can be used again and again. Just store the ingredients in a jar when not in use. When you’re ready to scent your home again, add the ingredients back to the pot, add water, and simmer again. Potpourri is a classic DIY air freshener. And while you can buy potpourri at the store, you can easily make your own sweet smelling mixture by drying flowers and herbs on your own. Grab your favorite floral scents, along with a few delicious smelling herbs, like lavender and rosemary, and hang them upside down to dry. When the flowers have dried completely, snip the buds and place them in a bowl to naturally scent any room in your home. Make your own twist on a classic DIY air freshener by simmering it. Similar to a simmer pot, crockpot potpourri freshens your air using fresh, natural ingredients in your crock pot. To make a simple crock pot potpourri mix, add fresh citrus, like lime or orange, with sweet-smelling herbs. A great combination for crockpot potpourri is rosemary and vanilla. Place your fresh ingredients in the bowl of your crockpot and cover with water. Then, set the crock pot on low with the lid on until the slow cooker gets warmed up. Remove the lid to really let the scent move through your home. Just like baking soda, vinegar is wonderful for absorbing bad odors throughout your home. To use vinegar as a natural DIY air freshener, fill a spray bottle with one part vinegar to four parts water. You can spritz the air with the vinegar mixture on its own to instantly remove odors throughout your house. The vinegar smell will dissipate, but if you don’t like the smell of vinegar, you can sweeten the room spray by adding essential oil to the mix. Vinegar is not only great at removing smells from the air, but it also works to combat bacteria and disinfect the air as you spray. If you want to instantly brighten your home while also adding a fresh scent, flowers are the way to go. In addition to adding a pretty pop of color to any room, a fresh floral bouquet can also make a room smell amazing if you add the right plants. In addition to including fragrant flowers, you can enhance the scent of your floral bouquet by mixing in some herbs, like peppermint or rosemary.